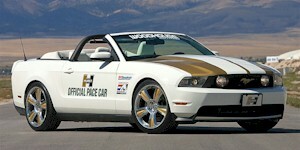 The 2010 Hurst Mustang Pace Car is a limited edition built by the Hurst's Performance Center in Irvine, California. 50 units were built. They are all Performance White GT convertibles with white interiors and white tops. Other features include; gold stripes, custom Hurst supercharger yielding 435hp and 400 ft-lb of torque, 20-inch polished forged aluminum wheels with gold-painted center spokes, BF Goodrich's g-Force KDW tires, an Eibach suspension components, Hurst-tuned coil-over dampers and upgraded anti-roll bars, gold Hurst shift handle, Hurst embroidered seats and floor mats, and Hurst team signatures on the trunk. This is the 2010 BF Goodrich/Hurst Mustang Pace Car. It was the official pace car at the Ford Racing Mustang Challenge race on September 19, 2009. There are 50 replica units produced at Hurst's Performance Center in Irvine, California for public sale. Each car gets a custom Hurst supercharger which give the engine 435hp and 400 ft-lb of torque, 20-inch polished forged aluminum wheels with gold-painted center spokes, BF Goodrich's g-Force KDW tires, an Eibach suspension components, Hurst-tuned coil-over dampers and upgraded anti-roll bars, gold Hurst shift handle, Hurst embroidered seats and floor mats, and Hurst team signatures on the trunk. Here is a 2010 BF Goodrich/Hurst Mustang Pace Car replica. 50 of these units were built. This is unit #4. They are all Performance White GT convertibles with white seats, white convertible tops, and white top boots. Unique to the Hurst Pace Car are; Hurst pistol-grip shifter, Hurst 20x9" front and 20x10" rear polished aluminum wheels with gold painted spoke insets, BF Goodrich KDW performance tires, Hurst exterior graphics and badges, Hurst series 2 sequentially numbered dash badge, Hurst/Roush supercharger, Hurst/Magnaflow stainless-steel cat-back exhaust, Hurst/Eibach coil-over adjustable suspension and sway-bar, Hurst Air-Speed rear spoiler, Hurst leather interior with contrast top-stitching and embroidered logo, Hurst embroidered logo floor mats, and Hurst Gold racing stripes.